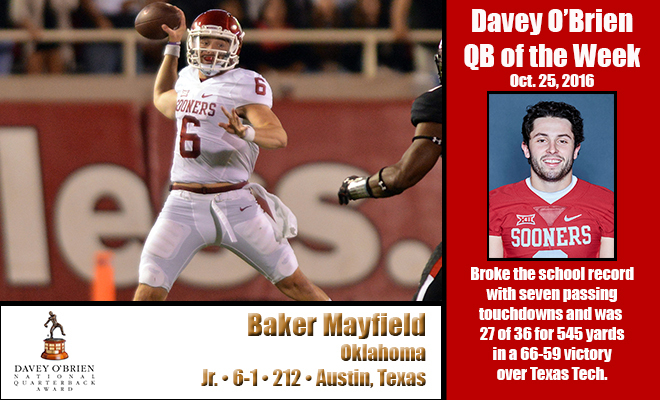 FORT WORTH, Texas (Oct. 25, 2016) – For the third time in his career, and the first time in 2016, Oklahoma’s Baker Mayfield has earned Davey O’Brien Quarterback of the Week accolades. In a 66-59 victory over Texas Tech, the junior collected a school-record seven passing touchdowns and threw for 545 yards, just nine shy of the Sooners’ single-game record. Mayfield connected on 27 of 36 attempts on the night with no interceptions and a career-best passer rating of 266.3. He averaged 20.2 yards per completion and 15.1 yards per attempt. His 564 yards of total offense were eight shy of his own program record. The native of Austin, Texas, ranks among the NCAA leaders in numerous categories, including first in yards per pass attempt (11.02) and third in passing efficiency rating (194.9; the NCAA single-season record is 191.8), completion percentage (.714) and yards per completion (15.45). In addition, he is sixth nationally in both passing touchdowns (23) and points responsible for (158), and ninth in passing yards (2,348) and total offense per game (353.0). One of three finalists for last year’s Davey O’Brien National Quarterback Award, Mayfield earned the weekly honor twice in 2015 (Sept. 22 and Nov. 17). All FBS quarterbacks are eligible for the weekly award, which is determined by a subset of the Davey O’Brien National Selection Committee. The other “Great 8” quarterbacks in week eight were: Jerod Evans of Virginia Tech, Washington State’s Luke Falk, Ben Hicks of SMU, Louisville’s Lamar Jackson, Patrick Mahomes II of Texas Tech, Middle Tennessee’s Brent Stockstill and Will Worth of Navy.